The Crabbe lab is interested in studying the role of telomere dynamics in the nuclear organization of human cells. 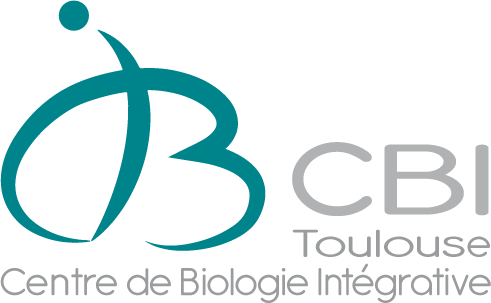 We focus on the interactions between telomeres and the nuclear envelope during the cell cycle, and study the impact of telomere distribution on genome stability, nuclear organization, gene expression, DNA repair and cell growth. Telomeres, the natural ends of linear chromosomes, protect our genetic material from degradation and our chromosomes from fusion. They consist of tandem TTAGGG repeats and their status are regulated by the Shelterin protein complex that controls telomere length and telomere integrity. Interestingly, telomeres have an essential function in the organization of the nucleus in a variety of organisms. 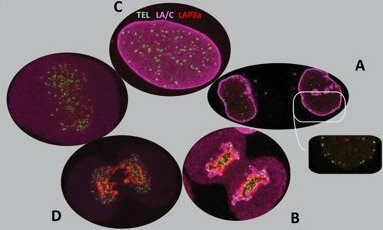 The interphase nucleus is highly compartmentalized, and during the last decades it has become clear that chromosomes occupy specific discrete territories. This spatial organization of the genome has emerged as an essential aspect of gene regulation and genome stability, and the function of human telomeres in this process is still elusive. We are using a wide range of techniques from basic cellular and molecular biology, biochemistry, advanced microscopy on fixed and live cells. We also developed MadID, a new technique to map protein-DNA interaction (Sobecki et al, Cell Reports 2018). Michal Sobecki, Charbel Souaid, Jocelyne Boulay, Vincent Guerineau, Daan Noordermeer, and Laure Crabbe. Pardo, B., Crabbe, L., and Pasero, P..
Sobilo, L., Kurfürst, R., Loubens, V., Martin, M., Mondon, P., Jeanneton, O., Heusèle, C., Ossant, F., Lespessailles, E., Toumi, H., Crabbe, L., and Schnebert, S.
Cesare, A.J., Hayashi, M.T., Crabbe, L., and Karlseder, J.